ESL Jobs has made all reasonable efforts to ensure that all information provided through this web site is accurate at the time of inclusion, however, there may be inadvertent and occasional errors for which ESL Jobs apologises. Use of this site constitutes your acceptance of these terms and conditions which take effect on the date you first use the site. ESL Jobs reserves the right to change these terms and conditions at any time by posting changes online. You are responsible for reviewing regularly information posted online to obtain timely notice of such changes. Your continued use of this site after changes are posted constitutes your acceptance of this agreement as modified by the posted changes. ESL Jobs accepts no liability for any inaccuracies or omissions in their web site and any decisions based on information contained in this web site are the sole responsibility of the visitor. ESL Jobs accepts no liability for any direct, special, indirect, or consequential damages, or any other damages of whatsoever kind, resulting from whatever cause through the use of any information obtained either directly or indirectly from this web site. Material may not be copied, reproduced, republished, downloaded, posted, broadcast or transmitted in any way except for your own personal non-commercial home use. Any other use requires the prior written permission of ESL Jobs. You agree not to adapt, alter or create a derivative work from any of the material contained in this site or use it for any other purpose other than for your personal non-commercial use. You agree to use this site only for lawful purposes, and in a manner which does not infringe the rights of, or restrict or inhibit the use and enjoyment of this site by any third party. Such restriction or inhibition includes, without limitation, conduct which is unlawful, or which may harass or cause distress or inconvenience to any person and the transmission of obscene or offensive content or disruption of normal flow of dialogue within this site. 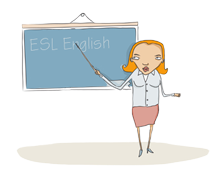 This site and the information, names, images, pictures, logos and icons regarding or relating to ESL Jobs, its products and services (or to third party products and services), is provided "AS IS" and on an "IS AVAILABLE" basis without any representation or endorsement made and without warranty of any kind whether express or implied, including but not limited to the implied warranties of satisfactory quality, fitness for a particular purpose, non-infringement, compatibility, security and accuracy. In no event will ESL Jobs be liable for any damages including, without limitation, indirect or consequential damages, or any damages whatsoever arising from use or loss of use, data, or profits, whether in action of contract, negligence or other tortuous action, arising out of or in connection with the use of the site. ESL Jobs does not warrant that the functions contained in the material contained in this site will be uninterrupted or error free, that defects will be corrected, or that this site or the server that makes it available are free of viruses or bugs or represents the full functionality, accuracy, reliability of the materials. The names, images and logos identifying ESL Jobs and their products and services are proprietary marks of ESL Jobs. Nothing contained herein shall be construed as conferring by implication or otherwise any licence or right under any trade mark or patent of ESL Jobs, or any other third party. Any visitor to the Web site providing information to ESL Jobs agrees that ESL Jobs has unlimited rights to such information as provided and that ESL Jobs may use such information in any way we may choose. Such information as provided by the visitor shall be non-confidential. These Terms and Conditions shall be governed by and construed in accordance with the laws of Australia. Disputes arising here from shall be exclusively subject to the jurisdiction of the courts of Australia. Some links in this website will let you leave this web site. The linked sites are not under the control of ESL Jobs and ESL Jobs is not responsible for the contents of any linked site or any link contained in a linked site. ESL Jobs is providing these links to you only as a convenience, and the inclusion of any link does not imply endorsement by ESL Jobs of the site.